A new moon in Gemini this Thursday ushers in two unlikely companions taking time for a tense talk. As Pluto and Venus square off, two cards emerge in extraordinary harmony, offering alternate frames of reference for a very variable state. The ultimate expression of power is its Death; release of control of a thing only to welcome it. Bones are said to contain the soul. When we strip ourselves of the illusion of power, we become bare bones. When we take a sledgehammer to known qualities that have smothered our soul, we free ourselves. Expression of power over others is violence. Expression of power within ourselves is liberty. We must release control over people, situations and the ties that bind us within social constructs. We must feel what it means to be fragile if we mean to feel free. True opportunity exists within the dark expanse of nothing that death rains down as it carries us to the end of the stories we tell ourselves. In true Gemini fashion, Death is accompanied by a twin, a seemingly opposite being. While Death is complete with the wisdom of many years, the Daughter of Cups is a delicate initiator of calm innocence. Where Death provides the expanse of quiet, black, nothing, the Daughter is full of visions and dreams. Her imagination teems with colorful curiosity and heartfelt reflection. Her eyes light up at golden opportunities; orbs waxing bright with the moon, illuminated by the scholarship applied to her emotive work. Gemini is a season for siblings. 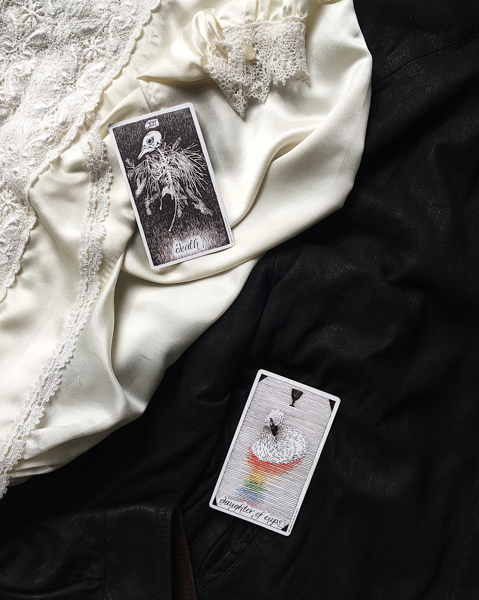 For complementing counterparts, communicating for competence, combining yin with yang in the spirit of creative curiosity. Gemini asks why, commits to questions, thrives on an open mind and cures conflict with conversations that offer opposing perspectives while setting aside judgment in favor of frequent reinterpretation. Gemini sees both sides of the story then writes a new one. This week, shift your story to one that affirms the power found in the bare bones of love.